This model contains time delays and is unsuitable for solution using CellML. There are additional problems with the model, but the presence of time delays rendered these superfluous. Clinical studies of drug therapy in patients infected with HIV-1 or the hepatitis B virus provide the opportunity for estimating the kinetic constants of virus replication in vivo. 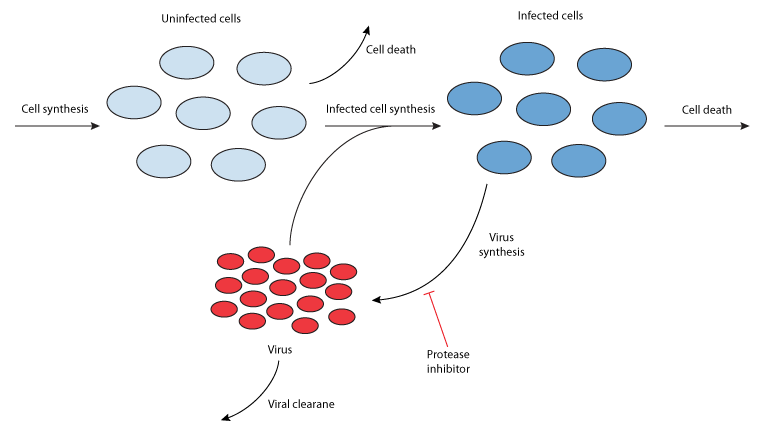 Treatment of HIV-1 with protease inhibitors results in the decline of free virus in several distinct phases: Initially the plasma virus load remains virtually unchanged, then after this initial delay, the plasma load declines exponentially, due to the decreased virus synthesis in infected cells, and also due to the clearance of free virus particles. Finally, the rate of virus decline decreases, and the viral load may even begin to increase again as the virus evolves a resistance to the protease inhibitor. This publication by Herz et al. quickly followed an article by Perelson et al. (1996) in which they developed a mathematical model of HIV-1 dynamics in vivo based on their experimental data. In this current publication, Herz et al. develop a new model that provides a description of HIV-1 dynamics, including the effects of an intracellular delay (the period between infection of a cell and the production of new virus particles). This model accounts for the effects of a protease inhibitor on the rate of viral synthesis (see the figure below), and it has been encoded in CellML and can be downloaded in various formats in . Schematic summary of the dynamics of viral infection in vivo. Derived from workspace Herz, Bonhoeffer, Anderson, May, Nowak, 1996 at changeset 434bd8a2bbfb.